for Moda Bake Shop, my Rowenta Pro Master Iron stopped working. Completely. When I plugged it in, it wouldn't turn on at all. Nada. Zilch. It was finished. Not good! I tried to figure out just how long I've had this iron but I can't remember. I do remember that we were still in the old house when my trusty old Black and Decker iron died and we've been in this new house for 3 1/2 years so I've had this iron for at least that long. But considering that I paid about $100 for it, it didn't last nearly as long as it should have for that price. Thankfully I had a backup all ready and waiting, the Rowenta Effective Comfort iron that I won at MQX East last spring, so I pulled it out of the closet and plugged it in. Here you can see the size difference between the two irons. I'll admit that I don't love this iron so far. It doesn't seem to get as hot, although it states that it is 1600 watts (the Pro Master was 1700 watts) and it is definitely a lighter weight. The few times that I have used it, I remembered to empty the water right afterwards but the one time that I didn't it spit all over the place the next time I turned it on. The Pro Master's water reservoir lid was able to prop up so the chamber was able to dry out between uses but the Effective Comfort's reservoir does not. When people say that there is a difference between the Rowenta's that are made in Germany and the ones that are made in China, they are right. The Effective Control is just less impressive, less metal and more plastic. I don't have high hopes for its longevity and am researching options for a better long term solution. Once I find one, this one will get returned to the closet to be my backup. So what iron to you use and would you recommend it? I've considered the Oliso irons but the lowest price one gets mixed reviews plus it has an 8 minute automatic shut off. I hate that. And it is hard to swallow the much higher price for the other Oliso models. I really want an automatic shut off that is at least 15-30 minutes and once it does shut itself off, I want it to heat back up lightening fast. I'm willing to deal with using distilled water, but the ability to use just plain tap water would be wonderful (thankfully I don't have hard water here). Bed, Bath and Beyond does carry this Rowenta Eco Intelligence Iron ($119) and it got 4.5 stars from 38 reviewers plus it doesn't cost almost $200 so I'm considering it. Better yet I can get it on Amazon for about $87. 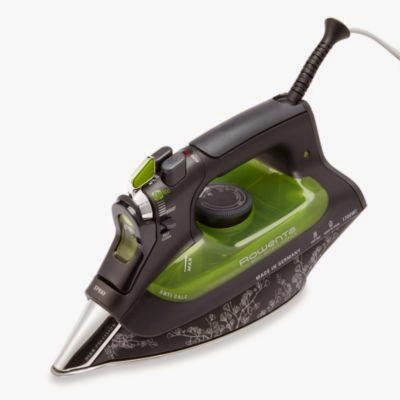 Good Housekeeping's review gave it a A- but says that the sole plate struggles to maintain heat and I can't seem to find anywhere where it actually states how long the auto shut off kicks in at but I'm betting it is 8 minutes like most other irons. My Pro Master was the same and while that wasn't the horrible, it wasn't great either. Two out of the 3 other irons that GH lists as their best picks aren't available any longer. Reading the reviews on Amazon gets confusing. Many of the less expensive irons get 4+ stars but I'm really hesitant to try that route again. The last time I had to replace my iron, I tried quite a few cheaper irons with horrible results and that is when I tired my first Rowenta. Quilters do use irons differently than the average person so our needs are a bit different so I guess I'll keep searching a bit more before I make my final decision. I'm willing to spend more money for an iron if it gets me one that is reliable and will do the job but also won't kick the bucket after a couple of years. It stinks that I have to do this research again and I really wish that irons weren't just another throw away appliance. Why can't a company make a good iron that works well and will last but doesn't make us empty our wallets to be able to afford it? I'm sure the iron manufacturers aren't listening but I can't help but wish for that anyway. Update: I do appreciate everyone's thoughts so far and I'm still researching options. For every strong contender I seem to find, there are plenty of negative reviews too. I really would prefer to be able to buy locally in case I have to return it but two of the contenders, including the Rowenta pictured above, aren't even available to me locally. The search continues! I'm a die-hard Black&Decker person - have three in fact. I keep one strictly for dry and one small/lite model for travel and then my main baby. My small one is 5 yrs old (bought it when I joined my quilt guild for classes) and the other two - well, I don't remember when I got them - so they have certainly earned their keep/price. Classic Black & Decker for everyday & quilt tops - dry! And new to me (this year's Christmas present) for pressing pieces/blocks & for traveling: Sunbeam Hot 2 Trot travel iron (Target $12.99) - again dry. Good Luck! BTW, what kind of manufacturer warranty did the dead Rowenta have? Three year lifespan seems awful short for that much money. Good Luck with the search! After going through Sunbeams, Black and Deckers and Rowentas, I finally spent the money and bought the Oliso (yellow). I love the delayed auto off, the quick heat up, the steam, tap water use and all else. The only thing I am not crazy about is how it is set to empty the water at the end of use. It seems very inefficient. Would I buy it again???? Absolutely! I've got the Panasonic L70SR Cordless Steam Iron and I love it -- it's not very expensive, the water reservoir detaches to make it lighter weight and it get amazingly hot. I got mine about a year ago from Walmart for about $40 -- the bonus is if yours breaks you simply take it back to Walmart. I think it was 3 yrs ago in the summer I bought myself a new iron from Shark. Never seemed to get as hot as I expected to iron/press cotton, and one day I went down to sew, and no iron. Dead. Had never used any water in it, just spritzed things. Won't bother with that brand again. I did have a Norelco that I used for 10 yrs, but when I looked for another, I couldn't find one. Forgot what I have I'm using as a backup now, but the one thing I don't especially care for is the "tip" or "nose" as I call it. I like one with a narrow tip, not a broad point. And you are right, quilters do have different needs and uses that the person that presses clothes. How many of those people are left (I used to be one, not anymore). There are probably more quilters using irons than there are people ironing clothes. There's a market. Who is going to accept the challenge? $100+ for an iron? I.DON'T.THINK.SO. When my Black & Decker died last year after 12 years of service, I did the research and bought a Rowenta. I hate it. It cycles on and off all the time, so I have to unplug it after every use. It is heavy, too. I'm going back to Black and Decker. I purchased my Rowenta travel iron 12/22/13. It died 12/28/14 (is there an epidemic? ), just 6 days AFTER the one-year warranty expired. I was skeptical of buying a Rowenta in the first place, but gave it a try based on a recommendation. No more!! I have to agree the Black and Deckers are much more reliable. I find used ones in good shape in thrift stores and opt for even cheaper than cheap! I purchased a Shark brand iron but won't again. It spits water, if I want to use steam. I've tried Black and Decker also and it was "OK." Good luck on your research! To tell you the truth, my favorite irons have been the super-cheapies from Walmart! My very favorite was the one that they sell for less than $10, but my husband made me buy the next one up so that I had an auto-off feature. They are super-hot, heat up fast, and when they break down (usually after at least a year of use, sometimes more) you don't feel bad about chucking it in the trash and getting another one! I love the idea of the yellow Oliso, but won't pay that much for an iron ever again without using it first. I bought a Panasonic cordless iron (the football shaped one) when everyone in blogland was so hot on it, but found it to never be hot enough, and it cooled off too quickly between rests in the cradle. I'd definitely want a do-over on that one if one was available! PS I agree about Sharks - they leak and spit like a sieve! I had a Rowenta that leaked all over everything. Now I buy the cheapie irons..with the only requirement being steam and an auto turn off. I have 2 rowenta in 3 yrs. Never again. I went for cheap. I figure that it's cheaper to buy an inexpensive iron every year then to have one rowenta for 1 1/2yrs. So sorry for your iron woes! It's such a nuisance to have to shop for a new one. I used a Rowenta once and think they're way overrated. So, last time I research through Consumer Report and bought the #3 one of their top three. I have no regrets whatsoever! The only part that was difficult was finding that brand! It's a T-Fal. The best part about it is the steam settings (there are three, so it uses a lot of water on the highest setting), and the price, which was about $55. I've had it for going on four years now, and would definitely look at T-Fal models for my next iron. Do be sure to let us know what you end up with (besides the one you won). Rowenta Superpress 050 It's an older industrial model. I personally LOVE ... LOVE ... LOVE this lady and would buy the exact same model again. However she's definitely not for the casual iron / press / steam user. Fill her (separate) 1.5 cup purified water tank, hit the master switch and in less than a minute she has enough power to remove wrinkles from an Egyptian Mummy! The stainless steel plate still glides over any choice of material and she has never hissed or spit in revolt. At retreat roomies always request her presence. After reading the other Rowenta comments guess I'm a lucky quilter to have discovered this gem.